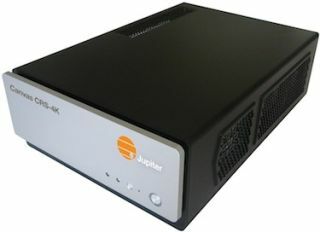 The What: Jupiter Systems' Canvas CRS-4K complements its award-winning Canvas enterprise software. The Canvas CRS-4K is a conference room system in a small, quiet box that enables powerful Canvas collaboration for teams in conference rooms and huddle rooms. Running the Canvas Client, CRS-4K allows teams to share live video, real-time data, documents, application screens, and presentations with remote users in a rich collaborative environment. The What Else: The CRS-4K supports up to four 1080p HD displays or a single 4K Ultra HD display, allowing even the smallest huddle room to have Canvas on the wall for powerful, collaborative teamwork. The CRS-4K is equipped with Jupiter's SimpleShare technology, which makes it possible for users without Canvas to share their laptop screens easily and instantly with local and remote Canvas users. With SimpleShare, Jupiter's advanced WebRTC implementation, any laptop can be a Canvas source without downloading software, connecting cables, or attaching dongles.